Bermuda’s 2016 – 2018 policing plan (BPS Strategic Plan) and it’s 5-point approach is succeeded by a 2018-2020 plan, the 2018 over-lap and it’s introductory in 2019 appearing to cause no questions. The latest plan was likely commenced in 2018 … these things take time … and possibly the result of hackneyed platitudes gained from the UK. That is not to say the UK is without useful observation and comment. there are obvious parallels and a blunt remark appears to be missing from Bermuda’s introverted approach – the Public Authority that is the police service, requires Government support. 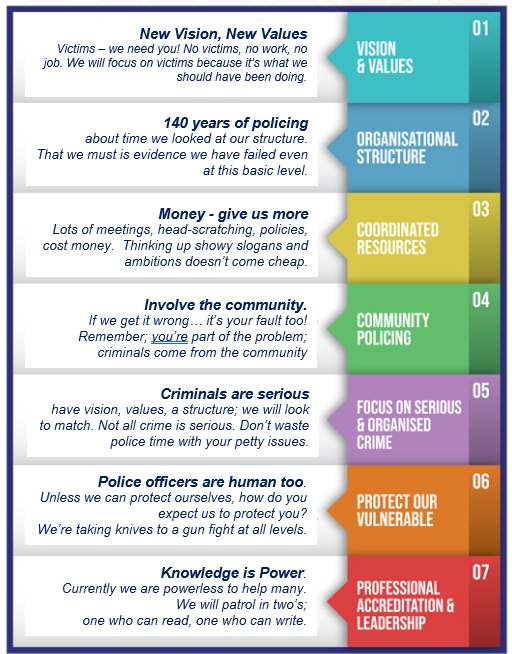 20/2018 – The UK’s Police Superintendents’ Association have commented upon ‘Policing for the Future’, a UK publication (summary here), which drew response from the Association President Gavin Thomas and can be read by clicking here. As for the Commissioner’s report, how much is original, how much cobbled together form other sources and presented to appease the masses?